An event is a record that something of interest has happened. For example, the event might show that an alert has changed state, AWS instances have started or stopped, and so on. To view the list of all events, select Browse > Events. By default, events are displayed as small dots on the X axis of most charts. 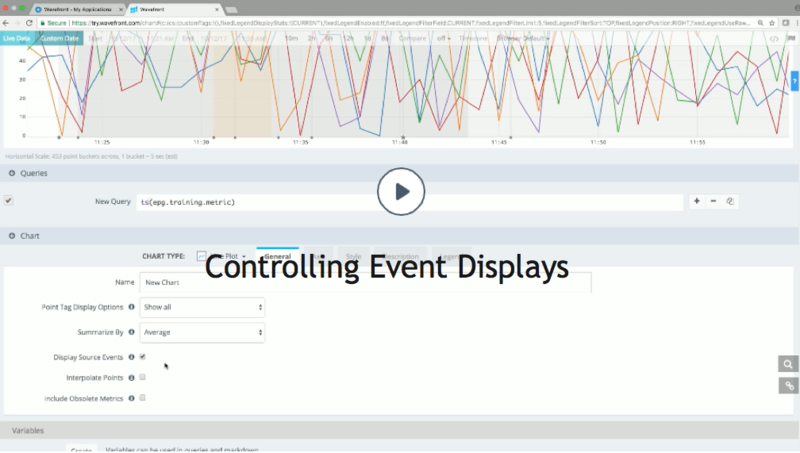 You can choose to display an event overlay to give users more detail, and you can further customize the event display using events queries. While every Wavefront user can view events, you must have Event Management permission to manage events. If you don’t have the permission, the UI menu selections, buttons, and links you use to perform management tasks are not visible. An event can have one of the following sources. System/Alert – When an alert fires or resolves, the source is System/Alert. System – When you perform actions in Wavefront, such as when you edit an alert or snooze an alert, or when newly affected sources fail or recover from an alert condition, the source is System. The Wavefront CloudTrail integration retrieves EC2 event information and creates Wavefront System events that represent the EC2 events. See CloudTrail Integration. For Microsoft Azure, some information from the Azure Activity Log integration is available as events. User – You can manually create events with source User to identify user actions. For example, you can create an event for code pushes that affect Wavefront metrics but that occur outside Wavefront. The event is then available on charts that display the metrics. Events have types and subtypes, which are typically used in events queries. Types include alert or alert-detail You can see types in the Type column of the Events page. A System/Alert and a System event can be in the Ongoing or Ended state. The events are Ongoing until all corresponding alert sources are recovered and the alert is resolved. Then the state changes to Ended. A User event can be in the Pending, Ongoing, or Ended state. A User event with a start time in the future has the state Pending. To improve event performance, we close events that have been ongoing for 60 days (based on start time). We also don’t return events for certain ongoing events queries. See When Does an Event Query Return Events. Note: You cannot have more than 1000 ongoing events on your cluster. 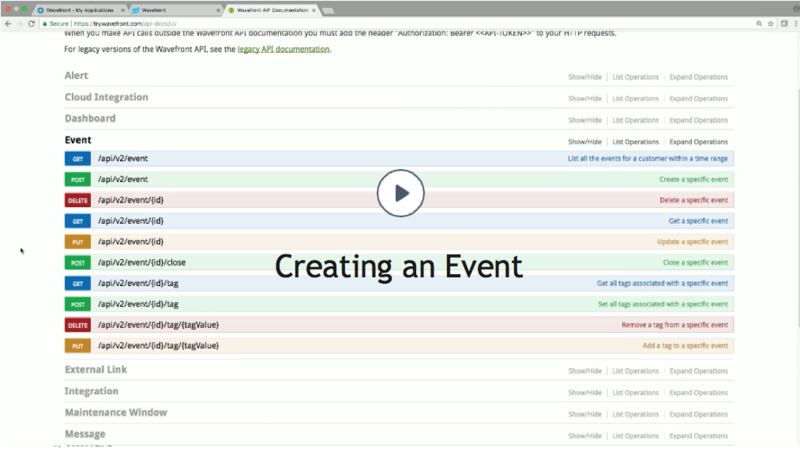 Use the ~events.num-ongoing-events internal metric to monitor the number of ongoing events. To view events, select Browse > Events. The Events list displays. Here’s an example event that shows that an alert was triggered. Click Browse > Events and filter by Source SYSTEM or ALERT on the left. In the event, click the View Alert link. <Alert name> - The display expression if one was specified. Otherwise, the condition expression. If the display expression is shown, the condition appears in a separate Alert Condition field. Alert Firings - An events() query that shows events of type alert for the alert. These system events occur whenever the alert is opened. The query shows both the current firing (an ongoing event) and any past firings (ended events). Alert Details - An events() query that shows events of type alert-detail for the alert. These system events occur whenever the alert is updated (continues firing while an individual time series changes from recovered to failing, or from failing to recovered). Alert Data - A query for alert metrics. These metrics are shown when the alert is open or updated. Select Browse > Events and click the Create Event button at the top of the filter bar. In a chart, click the flag icon in the top right corner of the time bar. Hover over the chart and set your cursor at a point in time. To make the event instantaneous, click that point. If the start and end time for the desired event are included in the current time window, click, hold, and drag across the window. Name Name displayed on the Events page and when you hover over an event icon on the X-axis of a chart. Type Type of the event, such as code push. Keep the type short. You can enter additional information about the event in the Details field. You later can enter the type as a parameter in events() queries. - The maintenance window starts on the specified date and time. Click the text field to select the start time. Instantaneous - End the event instantaneously with the start time. The exact interval is indeterminate. 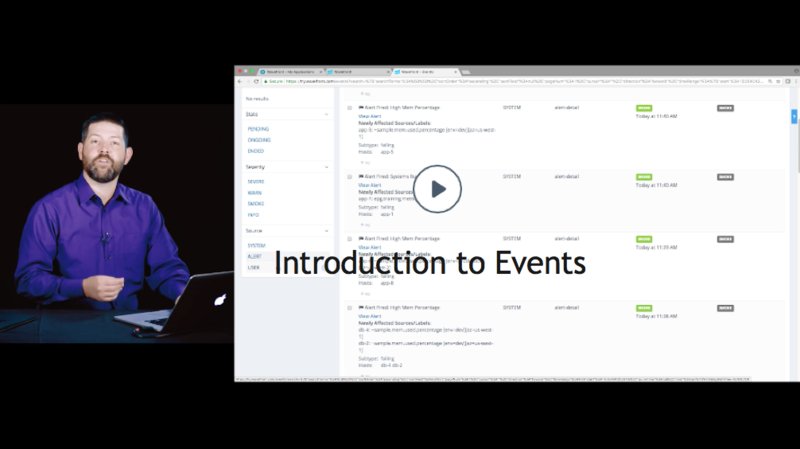 The Events page can report that the event starts and ends at exactly the same time or that it lasts a few seconds. Ongoing - The event does not have a specified end time. You can manually end (close) the event from the Events page. Wavefront closes events that are older than 60 days. - End the event at the specified day and time. Click the text field to select the end time. Note: If you can create an event with an end time, you cannot make changes to the event name or other event properties later. Classification The event classification: SEVERE, WARN, INFO, and UNCLASSIFIED. You can enter that classification as a parameter in events() queries. Tags Tags to associate with the event. You can start typing to select existing tags or create new event tags. Details Additional details about the event. Display Event in Chart Whether to add the events query to the chart so users can examine it later. Displays only when you create an event from a chart. Wavefront closes any event that is older than 60 days, based on start time. You can explicitly close events and delete user events if you have the right permissions. You can close an event if you no longer need it. It’s especially important to close ongoing events, which do not have an end time. Note: To prevent performance degradation, you cannot have more than 1000 (one thousand) ongoing events. Click the check box(es) next to the event(s). If the Close button is grayed out, you don’t have permissions to close the selected events. Click the Trash icon at the top of the Events page. If the Trash icon is grayed out, you don’t have permission delete the selected events.